The weather is lovely this time of year. Apples.,grapes and pumpkins are ready to be made into something special. I set a pretty table off our study patio. The harvest tablecloth has lots of fruit. I added these cute little acorn figures. I made dessert. How about some baked stuffed apples? I made this dessert for my husband and my mom. They thoroughly enjoyed it. These stuffed apples are easy to make. Hollowed out apples filled with apple filling and then baked. use store bought or make your own crust. Preheat oven to 375. Peel the extra apple, core and cut into cubes. Slide tops off the 3 remaining apples and hollow them out. I used a melon baller. Put the hollowed out apples and diced apple in pan and set aside. In small bowl, whisk together 1 Tablespoon warm water and 2 tsp. cornstarch. Set aside. In small saucepan over medium heat melt butter. Add diced apples lemon juice, cinnamon and sugar. Cook apple mixture until tender. Add the cornstarch mixture to the apples and cook for 5-6 minutes. Fill hollowed out apples with apple mixture. I used ready made pillsbury pie crust. Cut into lattice pieces, criss crossing over the apples. Put apples in baking pan and bake for about 30 minutes. Add a scoop of ice cream, caramel and enjoy. 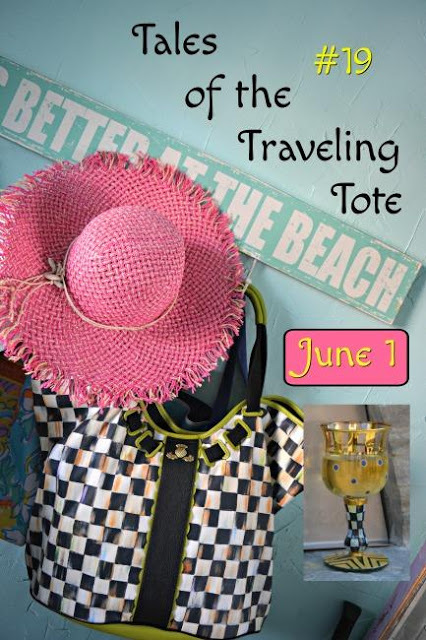 The latest on the pool cabana. The tile is finished inside and the mason finally showed up to start. It looks like this baby will be finished before the rains. Some finish work my husband has to do, but I am excited. What a wonderful tbale setting for an autumn dinner! I love the table décor. The apples sound delicious but since we are going on lower carbs, I wonder about leaving off the crust. Thank you Carol, by all means, lose the crust and enjoy the apple filling. I just got some apples and guess what I am going to make these. They look so yummy and make a great little dessert. 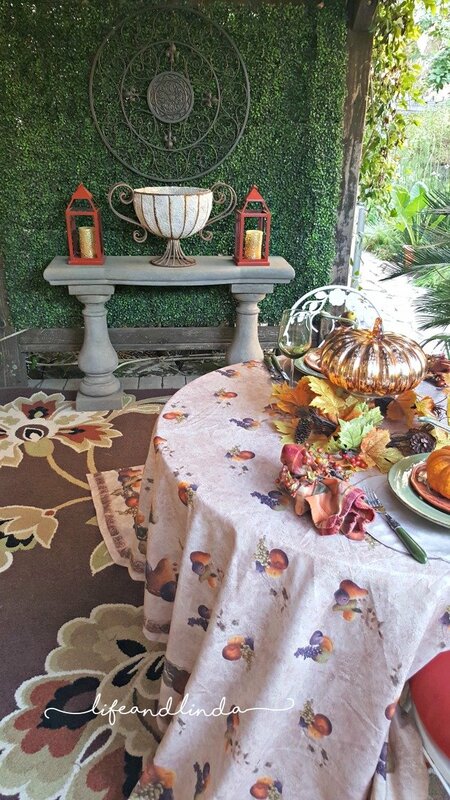 Love the table colors for fall. Very pretty. Hope your mom is doing better. Have a great rest of the week. Mmmm, those baked stuffed apples look elegant and delicious! 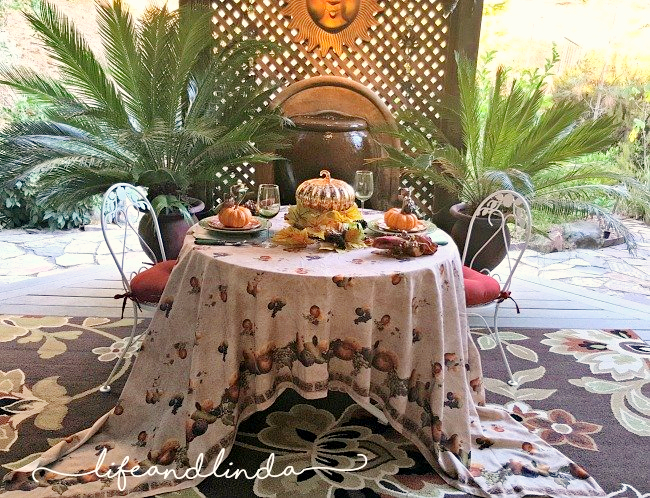 Beautiful harvest table setting Linda! 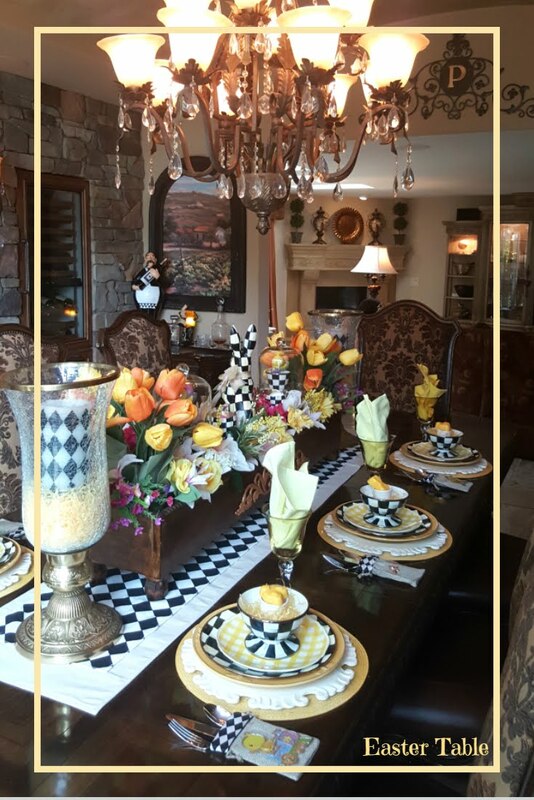 Love the tablecloth and dishes. The little acorn guy on the pumpkin is the cutest. That recipe looks so delicious and I like that it doesn’t sound too hard to make. Love the layered pastry on the outside. What a pretty table for two, Linda. Those acorn figures are adorable! Thanks for the recipe for the stuffed apples. I'd love to make them, and they look so pretty, too. Love the apple recipe Linda and I also have that mercury pumpkin(s)...I believe I found mine at Michael's a couple years ago and I love them. I am swooning over your little acorn guy....soooo cute. Where did you find him? I love the coziness of this setting and those desserts sound perfect for a cool morning. Fingers crossed we'll get our first cool day this weekend! Yes I would love a baked apple. I have to say the little scarecrow is darling! Setting a table for two is so sweet and something we will be doing much more of here at our house too. Such a pretty table and outside patio!! And the dessert looks delish!! 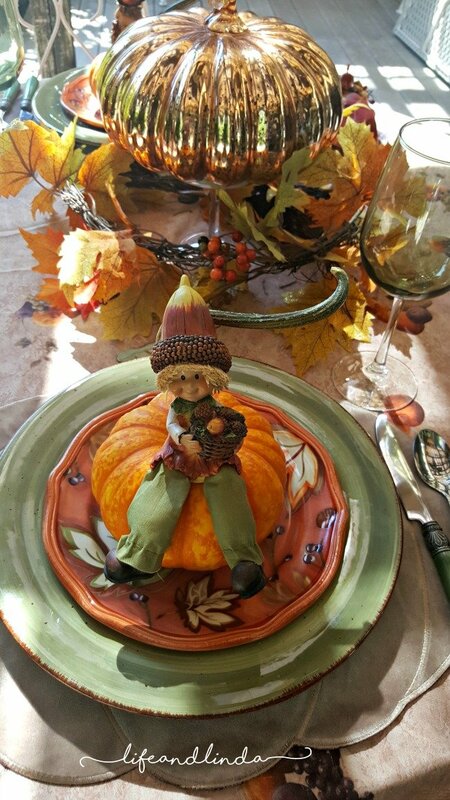 Your table is so fall fabulous Linda, I love the little acorn people! The stuffed apples sound amazing! 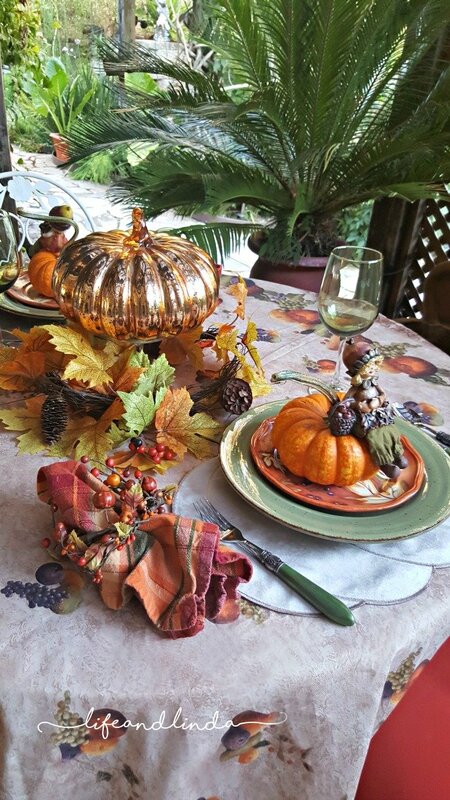 Such a pretty Fall table for two. The acorn people are darling ! 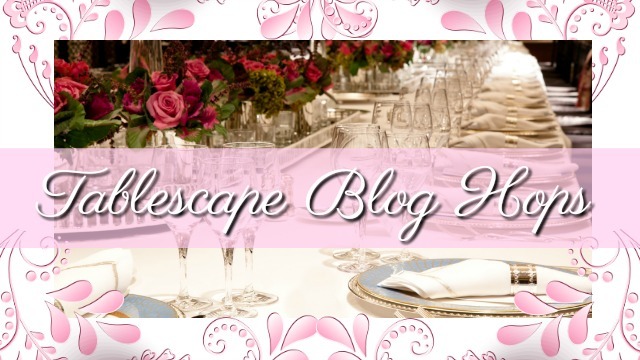 I'm so happy to see some of you that still tablescape, as it is the least I see in blogs or parties nowadays; I see mostly food which is funny, as we all started blogging with table settings and talking about the antique chinas, etc. You always do, so thank you for it too. 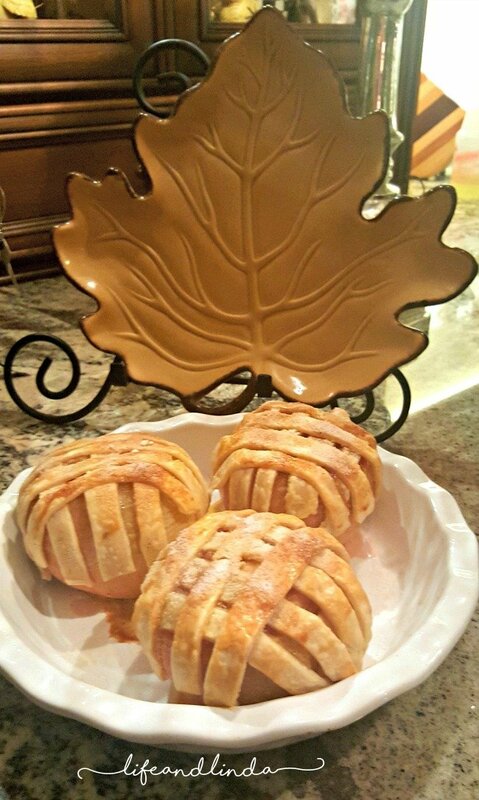 The apples look fabulous and thanks for sharing the recipe too. What a sweet table for two, Linda! Just lovely. 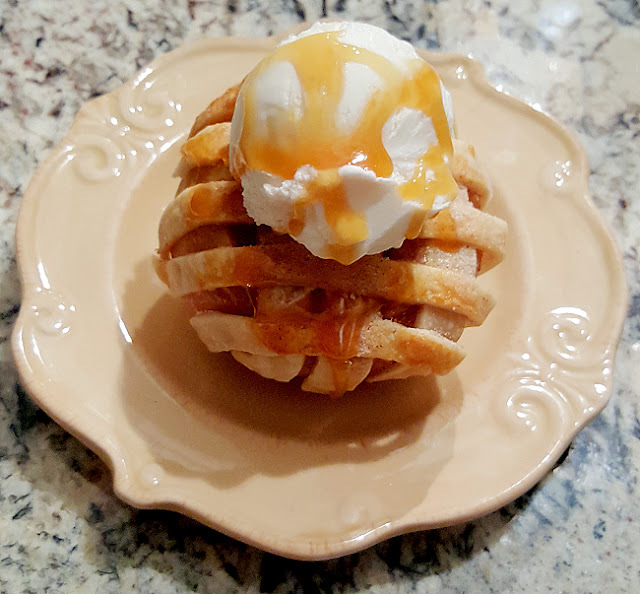 I copied over your recipe--what a fun dessert!! What a beautiful setting! 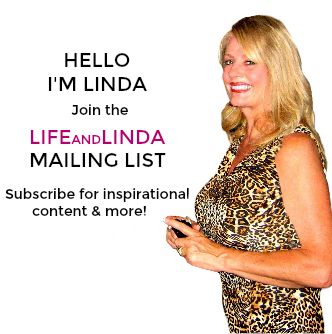 The little acorn fairies are so cute, Linda. The recipe looks fantastic. I will bake them the next time our oldest daughter is home because she loves baked apples! Hooray that the cabaña is coming along!!! I know you are way past ready for it to be finished!!! Wonderful! 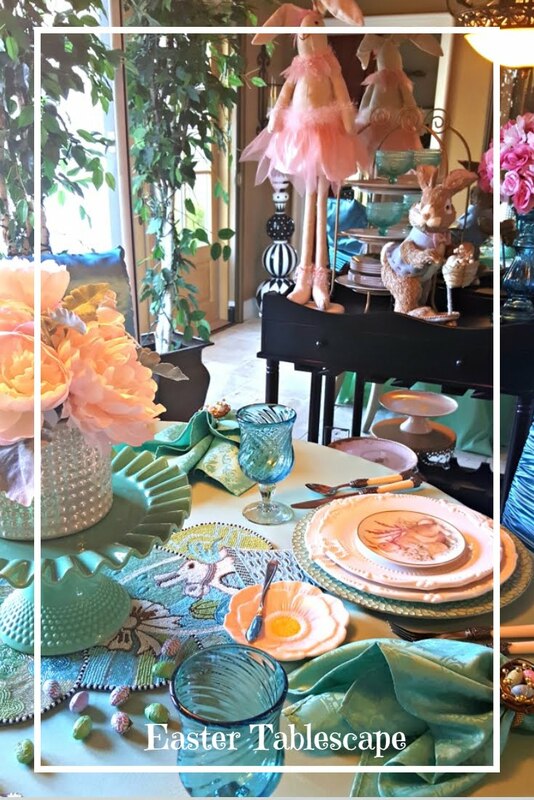 Your table is sweet, especially with those cute acorn figurines. 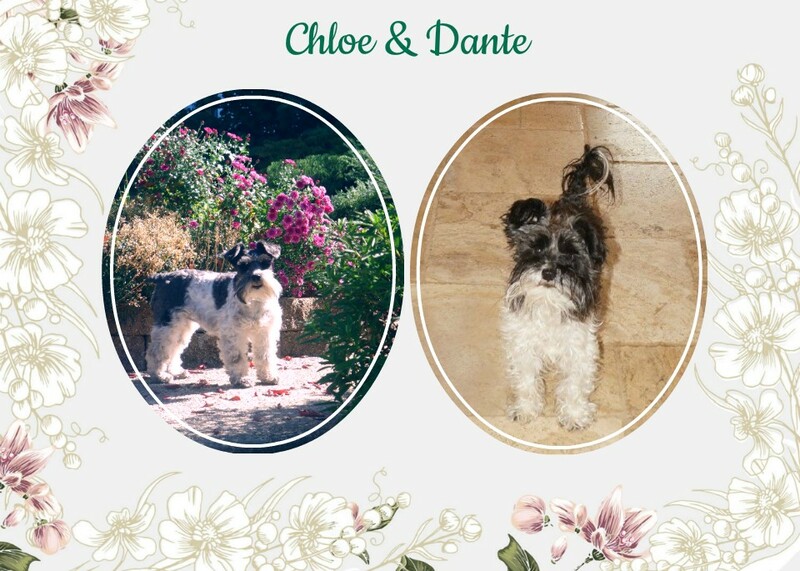 They’d make cute favors for guests. 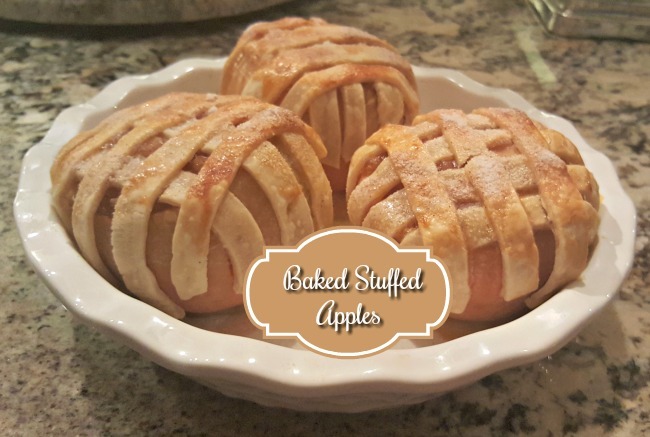 I’ve never had stuffed apples, but the recipe sounds super enticing! 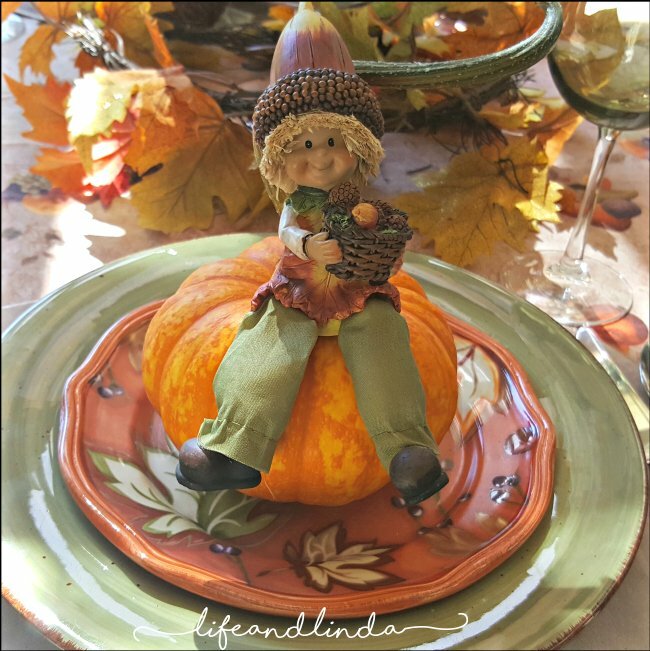 Hi Linda, I love the way you decorated the table for fall. The baked apple dessert looks so good and I too like using the store bought crust!